We abide by federal HIPPA guidelines, otherwise known as doctor-patient confidentiality law. The identities of our clients are strictly confidential. Even if a friend refers you, we cannot tell your friend whether or not you became a client. A commonly asked question is the type of vehicle we bring to your house. There will not be a “Lice Removal” Van parked in front of your house to advertise your problem to your neighbors. Actually, we come in a regular car. 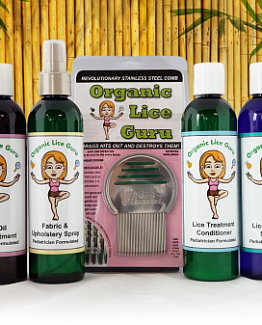 In general the Organic Lice Guru experience is very relaxing, unlike going to the doctor for lice treatment, or expecting that fairies will swoop in and make the nits in your hair disappear into thin air. Founded by a Solana mom with a Masters in Acupuncture and Oriental Medicine, who ran a professional health care service for years prior to Organic Lice Guru, we pride ourselves in maintaining the highest level of confidentiality and care with our clients personal information. Your peace of mind is always our top priority.